Sword-Site.Com: The World’s Largest Free Online Sword Museum! With the coming of this sword-type, we have reached the era of complete plate armour. Thought, of course, complete and homogeneous armour would not have been worn in its entirety, or even at all, by all men-at-arms, knights or otherwise. Mail, and occasional reinforcements of plate, or plain leather was often the only defense of the European man-at-arms. All the same, a type of sword had been devised to have some sort of capacity to deal with, at least to dent and hopefully to bore holes in, complete plate armour. These sword which I have classified as Type XVII had always a long hand-and-a-half grip, and a very stout blade of hexagonal section, occasionally with a shallow fuller, and often very heavy and always very rigid and stiff. The first wo swords I show in this section are very familiar to me, and though their blades at least look extremely alike, there is a great difference in weight and balance. The first, XVII.1 is in the Fitzwilliam Museum in Cambridge, where I frequently handle it, and the second, XVII.2, now in the Nationalmuseet in Copenhage, once hung upon my own wall. The Cambridge one is surprisingly light and responsive in the and, weighing only just over 2lbs; but the one I had is heavy, even clumsy – a sort of bar of iron, point-heavy and needing a lot of strength to use. There are many survivors of this type, nearly all of them alike and most not all that handsome. I have shown a few representative examples of a very large class of survivors, those which for some reason seem more interesting (such as those which have long ‘ricassos’ than the general run of what is on whole rather a boring type. Condition: River-found. Almost perfect beneath the smooth, richly dark patina of Goethite. There is no significant pitting in any part. On the tang is stamped a large lombardic letter B and on the blade, in the shallow fuller, is a little dagger-mar inlaid in latten (or possibly, gold? Publication: Redfern, W.B. ‘Some Choice Sword-Hilts’, Connoisseur, 1923, Laking, vol. I; Oakeshott, AOW; Oakeshott, SAC; Oakeshott ‘Arms and Armour in the Fitzwilliam Museum’, Appolo 1987. This sword in Cambridge, as familiar to me now in 1989 as if it was in my own collection is quite surprisingly light, and is beautifully balanced and ‘ready’ in the hand. There is a legend, written in horrible white paint, and the side of the blade not shown outward, to the effect that it was found ‘in 1845 in the River Cam at Ely’. This is a geographical impossibility. The river at Ely is the Great Ouse; the Came joins it about 4 miles above Ely, so if it was found in the CAm, it wasn’t at Ely; if it was found at Ely, it wasn’t int he Cam; but it doesn’t matter. The mud of both rivers has the same excellent preservative properties, and a difference of a few miles makes no difference to the sword’s excellence. The only difference perhaps is that a Ely the river could, even in the late 14th century, be approached in order to throw a sword in; but where the Cam joins it, in those days it was all marsh and impenetrable scrub land. It was in a great private collection, owned by an industrialist named Redfern, until it was bought by the Friends of the Fitzwilliam Museuam in 1947, and has always before been published as the Redfern Sword. A pity, it should be the Ely Sword, but I supose [sic] it is now too well established under its ephemeral collector’s name to be altered. Condition: Excellent. Indoor (armoury) preservation. 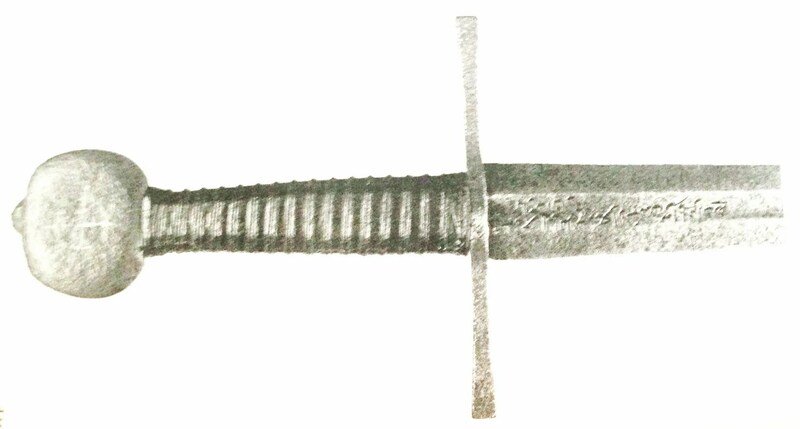 There is an Arabic inscription in Nashki script on the blade giving a date of A.D. 1436-7. There is a cross poten inlaid in copper in the pommel. Perhaps the sword of a Templar – though by the probably date of its making, say 1380, the Templars had been destroyed for over 60 years. The grip is a modern replacement. Publication: Christensen & Hoffmeyer, p.82, no.57; HOffmeyer, pl. XXe, p.17, no.27; Oakeshott, SAC pl.30b.